John Julius Norwich was wonderful historian in the tradition of brilliant story-telling, and his celebrated history of Venice is a classic. His books sell in many languages and he was an immensely popular lecturer and broadcaster. His A Short History of Byzantium (condensing his three volumes) was published by Knopf and Viking. The Middle Sea: A History of the Mediterranean was a considerable success. He edited the diaries of his father Duff Cooper for Weidenfeld. His dazzling The Popes was a bestseller in the USA and sold in many languages. 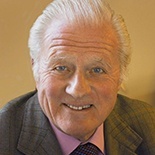 Darling Monster – The Letters of Lady Diana Cooper to Her Son John Julius Norwich 1939-1952 was a huge success with Chatto and was read on Radio 4. John Murray and Random House US published A History of Sicily. Murray and Grove US published The Four Princes – on Henry VIII, Francois I, Emperor Charles V and Suleyman. Murray and Grove published France – A History from Gaul to de Gaulle in April 2018. John Julius died in June 2018.